Since periodization training’s emergence in the 1950s, sport scientists have known that timing is one of the most critical programming variables influencing peak athletic performance. Modern research has taken the application of timing to exercise programming in a new direction, discovering the existence of time clocks inside each of the more than 600 skeletal muscles. Timing Resistance Training examines how these internal clocks use cues provided through exercise programming to regulate physiological processes for better performance. 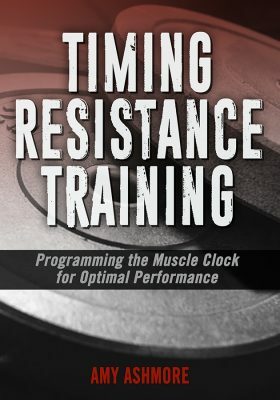 Not just another periodization book, Timing Resistance Training teaches you how to manipulate muscle clocks to train and perform at your best every day—right down to the specific time of day that is best for your body. You will learn to view the muscles as proactive independent physiological systems that can be trained to “think” by delivering timing cues to muscles that tell them when to activate key physiological actions that influence the entire body. Then you will learn how to cue those internal clocks with purposeful training methods like biomechanical pairing of exercises, complex training, and concurrent training. The book addresses rest as an integral training variable and explores the timing of activity–rest cycles versus recuperation only. The text also discusses the concept of undertraining, an intentional program design adjustment that uses the ability of muscle to anticipate training. The final chapters offer tools to create your own training programs for strength, power, and flexibility. These chapters include sample single-session workouts, weekly workouts, and long-term programming routines. With Timing Resistance Training, you can become more purposeful in planning and better utilize strategic timing to get the most out of muscles clocks and achieve optimal performance.